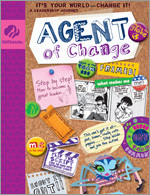 Simply put, the Junior Agent of Change - empowers! In this journey, for fourth-and fifth graders, there's a whole spiral of it waiting for each and every Girl Scout Junior. This powerful journey is filled with ceremonies and circles, real-life heroines, and special new characters, including the fashion-savvy spider named Dez. Along the way, girls learn how their own power combines into team power and then moves out to become community power. This Journey Book has 96 pages.